NCDV has been honored with an award at the Social Care Awards 2017. 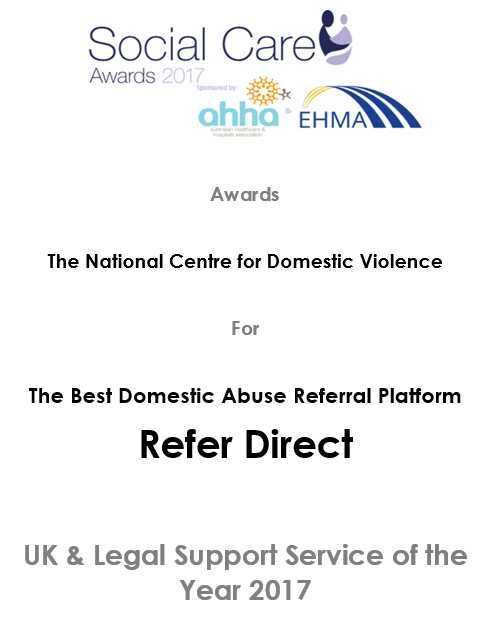 In recognition of NCDV’s online referral system, Refer Direct, the judges were unanimous that this type of forward thinking in a sector desperately in need of additional funding was delivering not only an excellent resource for agencies and police but also giving speedy protection to victims of domestic abuse and violence. 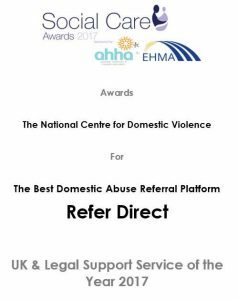 For this NCDVs Refer Direct system has been awarded the BEST REFERRAL PLATFORM. The Refer Direct platform together with the app sees thousands of referrals every month pass through. In turn this gives NCDV the ability to help more people in abusive or violent situations receive the legal assistance they require.